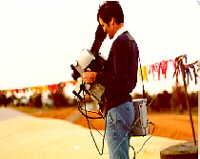 Thermoscan(tm) Inspection Services Pty Ltd. This paper introduces the discovery, development and just a few of the many applications of thermal photography - "THERMOGRAPHY". Then, utilising Thermography, Preventative, Predictive and Proactive maintenance techniques are examined. These are of course, basic to the maintenance, upkeep, preservation and continuance of commercial and industrial plant and equipment. The Royal Astronomer Sir William Herschel discovered "Dark Heat" radiation in 1800. 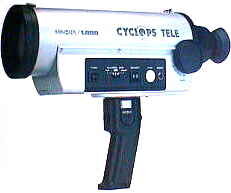 In 1880 the term infrared was coined. 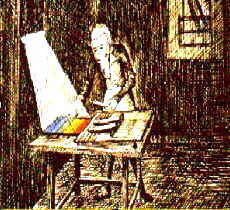 Samuel Langley invented the bolometer that measures variations of resistance when heated. In 1901 a bolometer could detect a cow at 400 meters. 1997 Saw crop temperature variations being determined from satellites and the development of high resolution Surveillance Cameras. Infra red thermography is based on the fact that all objects above absolute zero (-273°c or 0°K) emit infra-red radiation at a level proportional to their temperature. 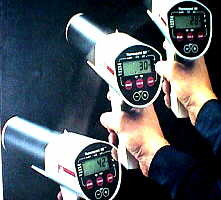 The infra-red radiation is of very low energy and therefor requires specially designed detectors. These are usually alloys of Lead/Selenium, Mercury/Cadmium/Telluride, and Indium/Antimonide, to name a few. Thermopiles - stacks of thermocouples - were also used. The detectors are then "built" into a readout device, handguns for very simple and quick digital temperatures or into thermal imaging radiometers. Handguns are of course limited to spot temperatures. Although the newer laser sighted guns make the location of the spot a lot easier. The guns are a very good maintenance tool. 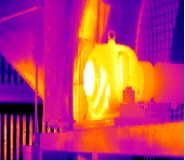 However, thermal imagers are far more efficient for diagnostic inspections and maintenance. 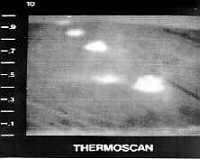 Early detectors used in the thermal imagers were cooled to -196°c with liquid nitrogen or argon gas, this gave the very fast response required for live imaging. 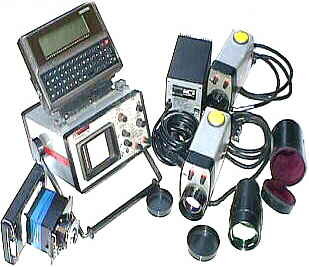 Many comprised two major components, the scanner and the monitor. The unit to the right was available around 1983 and had improved capabilities over the earlier more bulky models. 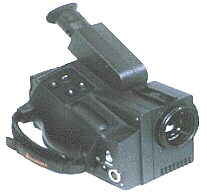 The thermal images were "photographed" using Polaroid cameras and then "stuck" into the reports. The first and some current Focal Plane Array radiometers use small refrigeration compressors and helium to achieve the low temperature necessary for detection and measurement. The very latest cameras use the "old" bolometer - which changes resistance with temperature - for detection and are un-cooled. 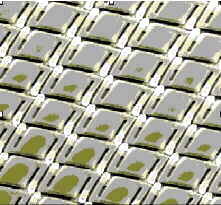 The photomicrograph shows a small section of a bolometer chip. Each chip has about 80,000 detectors which are approximately 0.02 millimeters square. The new Focal Plane Array cameras are much more portable and produce far clearer images. 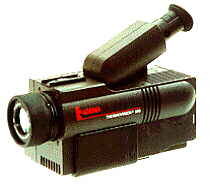 Both a cooled camera - to the right - and an uncooled camera are shown. on overhead lines and reticulation systems; hot spots on kilns, boilers and refractory lined vessels; measuring levels in tanks, etc. ; the list goes on and is only limited by the imagination. 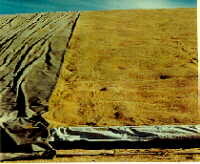 Nowadays much of our grain harvest is stored in huge on ground bunkers - 30,000 + tonnes, then covered with large tarpaulins. Moisture and infestation in the grain can cause significant deterioration and both generate heat - readily detected using a thermal imaging camera. In 'man portable' mode, I would circumnavigate the bunker looking from ground level at the lower 70% of the bunker. Then I would walk up on top and examine the top 30% on either side of the top. The various "hot" areas would be marked for later investigation. Here, the front of the Main Switchboard was scanned and a warm area observed. The astute thermographer concluded that there was a problem within the switch. The plant was shut down and the presence of the fault confirmed after the switch was opened exposing the contacts. The need for a replacement switch and lost production was averted. The Thermogram below left, shows a rather unusual phenomenon. The bridge conductor has some broken strands, only the complete strands are conducting. Transformers, LV connections and consumers pillar boxes also display thermal abnormalities. Using the thermal camera the therapist is able to locate the site of the inflammation on the patients back, here on the right shoulder. The Vet can identify the stressed areas on horses. A warmer area is present on the right foreleg below the knee. And, why is the lower left leg "cold". Here the plant engineer is able to measure bearing temperatures - without making contact. Especially in hard to reach locations. 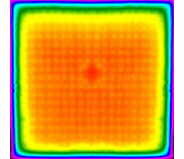 It is suggested that potential bearing failures can be detected earlier using thermography. In colder climates where double-glazing is required the thermal camera is able to determine the thermal efficiency of the window. This example is an Australian development. Remember: It is much cheaper to tighten a nut or screw than replace a burnt out component or extinguish a fire. So, what are the benefits that can be achieved from regular thermographic inspections? Knowing the type and location of the problem, the necessary replacement parts can be obtained and held ready for the repair. Repairs can be scheduled to a convenient time to suit all departments. Downtime is significantly reduced as all parts are available and in many cases the method of repair is known beforehand. Therefore the repairs take less time and are more effective. Inspections carried out before the maintenance shutdown can form the basis of the planned repair schedule. Repair crews are more efficiently utilised, fixing known problems rather than just tightening nuts and screws. The location of many problems can be readily identified. Around 80% of all the problems identified can not be seen because the insulation has not discoloured. The severity of the problem is known. The actual fault temperature is reported. Summarising, this paper has discussed the development and some of the many applications of the Thermoscan(tm) inspection. Preventative maintenance - the collection of data that enables the engineer take immediate corrective action to avoid a failure. Here the data, vibration, thermal, oil sample, etc is gathered and analysed to give a set of results which clearly are a "snap shot" of the plant conditions at the time of the inspection. With only the one result the engineer is not aware of the position of the data on the failure time line. Let me present a couple of examples. The results of the analysis of the oil sampled from the chiller compressor sump revealed a high iron content. The engineer could react immediately and shut down the compressor to inspect the cylinder bores. He also could wait a further period, resample and compare the two results. This second result may not be sufficiently conclusive and he may choose the wait still further. The "cautious" delay could prove disastrous. Similarly, the results from a Thermoscan(tm) inspection are graded according to temperature and those with high temperatures are recommended for service as soon as possible. However, often the temperature reported at the time of the inspection may not be excessive and the fault may have just started and therefor there is a bit of time available to monitor before repair. But, again the maintenance engineer does not know how much time he has available. Clearly if a number of readings are taken over a period of time a clearer picture of the data can be obtained. We thus have a condition-monitoring regime. And, a chart can be developed, this will enable the engineer to predict an event and to take corrective service action before failure. Predictive maintenance; the collection of data and comparing the results with previous values and noting the trends. The shape of the resultant chart enables the engineer to foresee when a failure is imminent. Re-visiting our two examples above. Had the results from the oil testing been plotted and were at position 7 or 8, a watching brief would have been placed on the compressor pending the next sample results. However, should the result been at position 9, clearly waiting for the next result could prove disastrous. Similarly, the Thermoscan(tm) results could be placed at position 7, 8 or 9 in either case. If either result were at 9 or 10 delay could prove expensive. Clearly, had the engineer had the benefit of the condition-monitoring chart he would be able to predict the future of the faults observed and implement the necessary service actions. Proactive maintenance; the collection of data relating to the type and components used during repairs. By analysing the collected data, the type and form of the repairs are analysed and steps taken to prevent the same failure happening again and again. Again revisiting our two examples upon review of the collective results from a number of compressors using a particular lubricant it may be found that premature wear is occurring in all compressors using that lubricant. Thus to prevent recurrent failure a lubricant change may be a prudent course of action. Similarly, the Thermoscan(tm) report accommodates an area for the repairer to make comment as to the format of the repair and the components used to effect the repair. Analysis of this information may lead to a particular trend becoming evident. Again, suggesting a change to a different type of component or repair technique, to prevent recurrence of the same type of failure - proactive maintenance. With the prudent combination of Preventative, Predictive and Proactive Maintenance actions the Maintenance Engineer is able to stretch his meagre maintenance dollar to enhance the performance of the plant in his care.